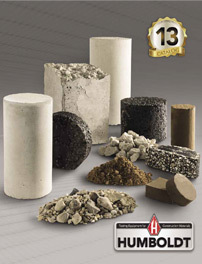 The Humboldt Concrete Rebound Hammer provides a reliable, economical alternative. Designed for testing thin-walled structural components with a thickness of less than 4" (100mm) or rock cores. Concrete Rebound Hammer redesigned to provide unmatched accuracy, repeatability and ease of use. All models also include a grinding stone, carrying case and instruction booklet with conversion charts so you can quickly make determinations about the strength of concrete structures, like bridges, parking decks, commercial structures and pre cast concrete structures. Schmidt hammers usually refer to those test hammers manufactured by Proceq, which we carry and are often referred to as the original Schmidt hammer.